Oh how the Brits love to poke fun at Napoleon! Two hundred years has not dampened their joy in pinching his cheeks. Last month, one of just a handful of letters written by Napoleon in the language of his arch-enemies and sent to De las Cases for comment was sold at auction for $400,000, more than five times its anticipated price. The one-page manuscript casts new light on Napoleon’s melancholy exile, which ended with his death, aged 51, in 1821. But it will also strike a chord with any teacher tasked with correcting students’ writing. 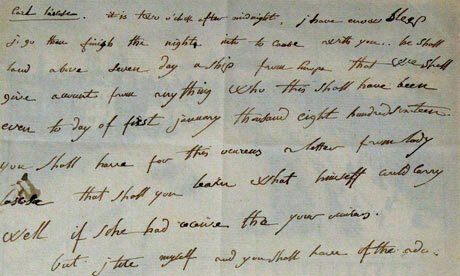 De las Cases recorded his time as imperial language teacher in his memoir and he says that Napoleon’s writing practice, often composed, like this letter, during sleepless nights, was returned corrected without delay. But where did De las Cases start? The 125 word text presents numerous language errors from grammar mistakes to lexis transferred from French. It opens: “Count Las Case. It is two o’clock after midnight. I have enow [sic] sleep, I go then finish the night into cause with you…” “Cause” has been borrowed from the French word causer meaning to chat. Now, here’s man in his early 50s, recently Emperor of The French, master of his domain, military genius, sponsor of the Code Napoleon – who has been imprisoned on a dank island in the middle of nowhere, removed from his land, his people, his family, his friends – and yet who has the presence of mind to try to learn, not just a new language, but the language of his enemies and wardens! How many people in their 50s try to learn a new language? Instead of poking fun at his attempts to learn English, we should be saluting his boldness. As ever, Napoleon refused to sit still, even when his lucky star had finally deserted him. Judging by the soundtrack, I’m pretty sure Mr Markham produced this marvellous video.